Leamington missed out on a lucrative FA Cup run, crashing out at the first hurdle against their Black Country rivals at Amblecote, writes Paul Okey. With £9,000 up for grabs for the winners, there was even more incentive for Brakes to arrest their poor run of results in the competition. Tony Breeden beats Robbie Thompson-Brown to the ball. However, Leon Broadhurst returned it with interest. However, it was a familiar story as they again bowed out to lower-division opposition having failed to recapture their impressive league form. They had looked like escaping Stourbridge with a draw after two late goals from Matty Stenson had cancelled out a Jack Lane own goal and a superb first-time strike from former Brake Leon Broadhurst. But despite having the momentum in the closing stages, they fell to an injury-time sucker punch from Kaiman Anderson who glanced in a cross from Chekaine Steele to maintain Stourbridge’s impress cup credentials. There was little sign of the drama to come in an opening 25 minutes which mirrored the miserable conditions. Jack Lane put into his own net early in the second half to give Stourbridge the lead. Both sides showed some neat touches in midfield but with the central defensive partnerships on top and referee Alex Kirkley keen to make his whistle heard, there was little to warm the hands of a crowd of 467. Stenson failed to latch on to Jack Edwards’ flick-on in the third minute with the ball continuing on to glance off a post. Kieran Dunbar was unable to recreate his Blyth heroics, hitting the wall with a free-kick and home keeper James Wren made a meal of an inswinging dead ball from James Bowen as the visitors edged the opening half-hour. The game then burst into life, with a free-kick from Robbie Thompson-Brown flicking off the head and shoulder of Broadhurst and inches past the far post to the relief of a static Tony Breeden. Anderson nipped in front of Breeden after a Thomson-Brown free-kick had been partially blocked by the wall but could only find the side netting and Ahmed Obeng had a goalbound shot deflected over the bat after smartly bringing down a Junior English cross. Paul McCone drew a smart save from Breeden after Brakes failed to clear their lines, with Broadhurst’s follow-up shot ruled out by an assistant referee’s flag. Stenson then latched on to a searching crossfield pass from Bowen, advancing on goal and unleashing a fierce shot from the angle of the box which Wren was relieved to tip over, with the ball on him before he had time to set himself. Jamie Hood headed the resulting corner over. A Thompson-Brown free-kick was always too high to trouble Breeden and Wren was called on to make a fine reaction save to deny Stenson from Dunbar’s cross. Broadhurst was then inches away from converting an Aaron Hayden cross. After waiting so long for the match to ignite, the half-time whistle came as a disappointment. Thankfully, the cup-tie’s new-found intensity was maintained after the restart. Three minutes into the second period the Glassboys took the lead. Thompson-Brown and Anderson linked up smartly on the right and the former Brakes man got to the byline before drilling in a cross which was put into his own net by Lane. Stenson lifted an intelligent effort on to the roof of the net as Brakes tried to respond, while Obeng did well to keep the ball in play on the byeline after the Stourbridge rearguard had switched off. However, no Brakes player was able to convert his ball back into the six-yard box. Lane then should have done better with a free header from a Dunbar free-kick, powering his effort past the near post from a central position. Despite Leamington pressing, Stourbridge doubled their lead in the 68th minute courtesy of an outstanding effort from Broadhurst. Thompson-Brown, who was clearly looking to make a statement against his former club, did well to beat the last man as the Glassboys countered. 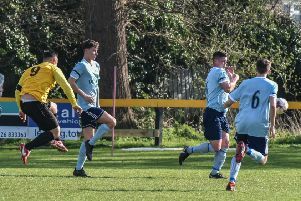 Breeden was out smartly to clear the ball from just outside his box but he could only look on helplessly as his clearance was returned by Broadhurst 40 yards out, with his first-time strike sailing over the keeper and his defenders and into the net. It could have been worse for the visitors a minute later, with only the outstretched arm of Breeden preventing Anderson making it 3-0. Brakes boss Paul Holleran, who had already introduced Connor Taylor, threw on Joe Magunda and Anthony Dwyer in place of Joe Clarke and Dunbar in a bid to pep up his shell-shocked side but the writing looked on the wall when Wren nipped out ahead of Stenson to win a through ball and minutes later produced a wonder save to keep out a point-blank header from the prolific striker. Stenson was not to be denied, however, and took advantage of an air shot from a defender to slot home from close range from the resultant corner. Tension started to seep into Stourbridge’s play and as they fell further and further back, Brakes took advantage to draw level. Hood’s header found its way through a mass of bodies and was kept out by the feet of Wren with the ball striking the following up Stenson and rebounding into the net off the grounded keeper. From looking dead and buried, the visitors now sensed they could end the tie without the need for a replay and only a desperate block from Hayden denied Dwyer as he looked to pick his spot from inside the box. However, Stourbridge summoned up the strength for one last attack, with Steele, in his first touch after coming on, allowed time to swing in a cross which was expertly converted by the head of Anderson. A costly strike in more ways than one. Stourbridge: James Wren, Aaron Hayden, Jordaan Brown, Paul McCone, Stuart Pierpoint, Aaron Forde, Callum Powell (Checkaine Steele, 90), Leon Broadhurst, Kaiman Anderson, Rob Thompson-Brown, Brad Birch (Darryl Westlake, 81). Subs not used: Aris Christophorou, Jake Evans, Kaouridjane Attoumani, Niall Maher. Brakes: Tony Breeden, Junior English, James Bowen, Joe Clarke (Joe Magunda, 72), Jamie Hood, Jack Lane, Kieran Dunbar (Anthony Dwyer, 72), Callum Gittings, Matty Stenson, Jack Edwards, Ahmed Obeng (Connor Taylor, 60).Subs not used: Shay Nicholson, Martyn Naylor, Tom James, Chris Jay.